When you invite people around for afternoon tea serving various scones, cookies and cakes on your Royal Copenhagen china you need some serving plates/dishes, which fit into this context. So in my local Royal Copenhagen outlet I found these two plates in the design of White Elements during the Summer sale, which means a price discount of 35% compared to the products of first class/sorting. So now I can serve various cakes and cookies, when I use my Royal Copenhagen China tea cups for afternoon tea parties. I have been embracing the art of making jelly after my participation in the Summer preserves course using the different fruits, which I can get access to from gardens of friends and colleagues. 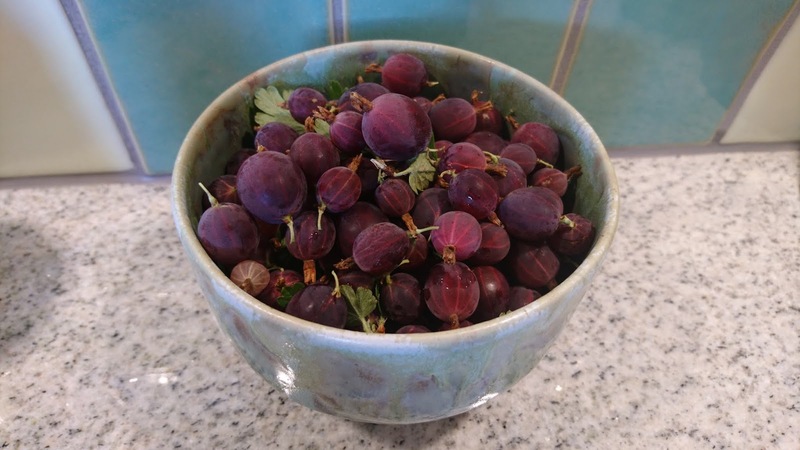 As I had some left overs of red gooseberries after making red gooseberry jam and a some red currant in surplus as well I decided to make a jelly of red gooseberry and currant using this recipe on jelly from red and black currant as starting point. And when I have experienced an issue with some defaults in the jelly during my experiment in the kitchen, I have looking into my jam bible of "First preserves marmelades jam chutneys" to find an explanation for the specific default. 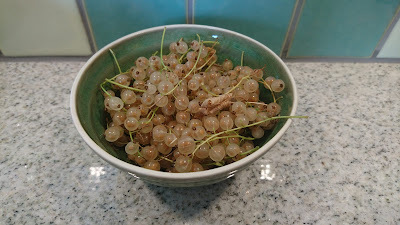 After my work with the white currant jelly I learned, that I already needed to check the jelly consistency already after 2 minutes hard boiling, as this white currant was gelling, when I poured it into the glass. Making this jelly I learned, that if you work with very small portions of jelly, when you should not stir the jelly during the cooking of the jelly mixture as this can give problems with too many air bobbles in the final jelly. In this jelly of red gooseberry and currant I now have one glass full of air bobbles !! Measure the amount of fruit juice and weight out 75 g sugar per 100 ml juice. Add in the (pre-heated) sugar, Stir until the sugar is dissolved. Let it boil for 2 minute as starting point, as I was surprised by very fast gelling as I poured the jelly into the glass. Test for a set after 2 minutes using the flake test (how the jelly is dripping from the cooking spoon). This is tricky, otherwise set, if the temperature is 104'C. Pour the jelly into glass jar, fill the jar to the top. Again remove any scum from the surface using a tea spoon. In connection with celebrating my round birthday of 50 years round birthday of 50 years I had to come up with a list of possible birthday gifts !!! In my opinion these suggestions should be something, that I could appreciate in my new decade with pleasure on a regular basis. As most of you probably already know, if you are regular reader, I really like to host an afternoon tea with a theme of some kind for good friends. And the only thing I have missed in this connection have been some real tea cups in china. Not coffee cups, but the real flat and delicate tea cups. So after a visit to a Royal Copenhagen Flagship store I found, that the series called "Prinsesse" and "Musselmalet Halvblonde" would suit my eye/taste. It is time again for the annual cake regatta at rowing club, where I have the honor of being the host here in 2018, as my cake hindbærsnitter (raspberry cuttings) won the title of 2017 champion baker of Vejle Roklub. As the host for the annual cake regatta I get to select the theme for this year´s, and here I have selected the theme"cookies" as the challenge. I will bring version 2 of the World´s best cookie as my contribution for the cake regatta this afternoon. By adjusting the baking time, when baking cookies, you can get your preferred texture in cookies. The baking time mentioned below will give you a chewy texture, which is my preferred texture in cookies. The addition of nuts are optional. 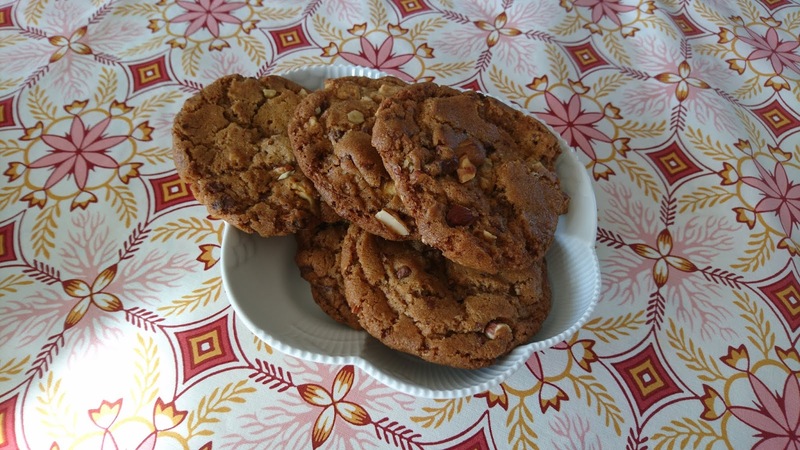 I decided to use a combination of almonds and walnuts. In the original recipe the added nuts are hazelnuts. 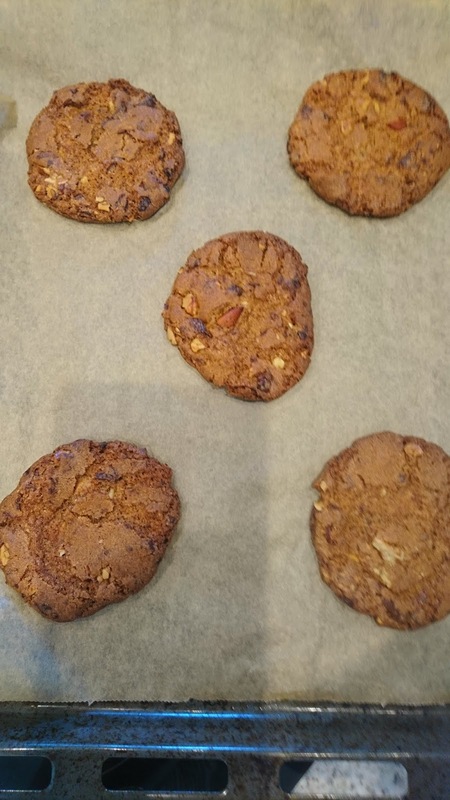 So just your preferred nuts in order to make these world´s best cookies into your best cookies :-) An option could be to added pecan nuts. This time I used a combination of dark milk and white chocolate instead of a combination of dark and white chocolate, as I am not really a fan of dark chocolate, as I do not like the bitterness in dark chocolate. Again add in your preference within chocolate. 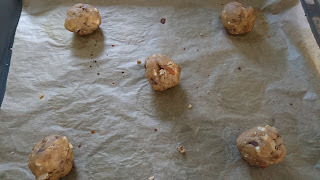 As the cookies float a lot during baking it is important NOT to place too many cookies on one baking tray, so my recommendation is to place 5 cookies per baking tray, as seen on the photos below. Finally stir by hand the chopped chocolate and nuts. Bake the cookies at 175'C for 14-18 minutes. As it has been some time since I last made "boller in karry" I decided to make this dish for my weekly Sunday dinner, which I serve for my mother. This time I used a recipe from Arla, where I made a few modification as I had more meat and too little dairy cream of 8% fat substituting the missing dairy cream with full-fat milk. Start by mixing the minced meat and salt together for 1 minute, which makes the meat texture more stiff in it. Afterwards mix in the minced onion, egg and pepper followed by the dairy cream and full-fat milk. Add in the fine oat flakes and stir well. Add in the minced onion and let it fry for approx. 1 minute. Reduce the heat and add in the curry and let it fry for another 1 minute. Add in the grated apple and let it fry for another 1 minute. Add in 4 dl of the boiling water from the meat balls little by little, as you whip the mixture. Afterwards add in the dairy cooking cream, and let the sauce simmer gentle for 5 minites. 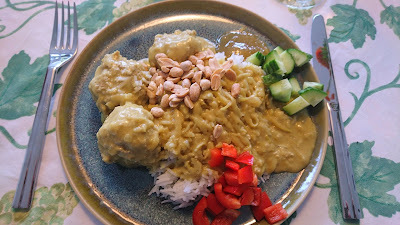 Serve the meat balls in curry together with boiled rice, chopped red pepper & cucumber, roasted peanuts and mango chutney. I keep experimenting using the various recipes and techniques, which I learned at the Summer preserves course using the different fruits, which I can get access to from gardens of friends and colleagues. 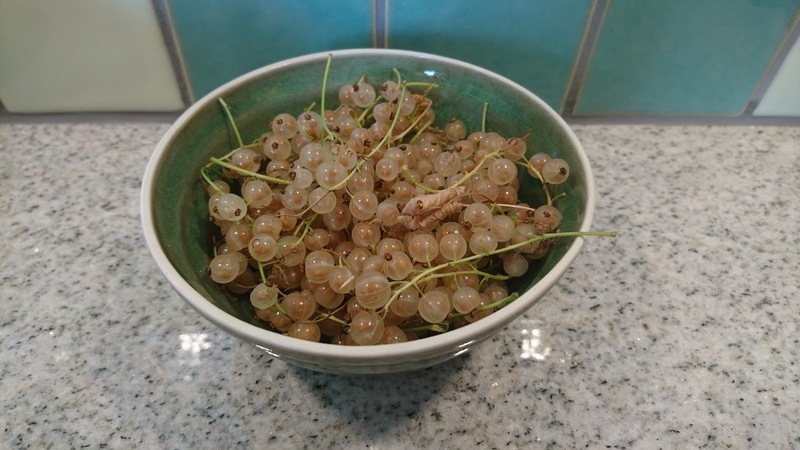 At this course we were making a jelly from red and black currant, so I decided to make a version based on white currants, which were in the garden of my good friends in Horsens. 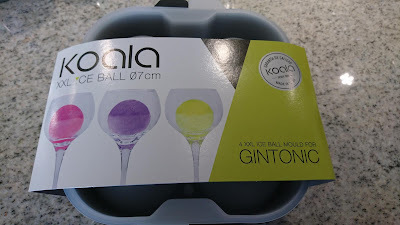 I did not make any changes in the recipe, however based on my experience in my own kitchen I would recommend you all ready to look for the setting of the gel after 2 minutes cooking, as my jelly started to gel, when I poured into the glasses. If you work with smaller portion of jelly, when you should not stir the jelly during the cooking of the jelly mixture as this can give problems with too many air bobbles in the final jelly. 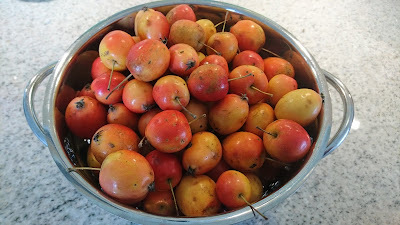 This time I have got hold of crab apples from the garden of my manager, so here I decided to make a jelly from those. I decided to cut the entire crab apple into smaller piece as a way of both removing the core of the apple (I dislike the bitterness of apple core) as well as spoiled part of the apple. Do not worry about removing the natural fruit pectin within the apple getting ride of the apple core. The pectin is not located in the apple core, the pectin is located in fruit part of the apple. I also decided to add in some acidity in form of apple vinegar for two reasons. First reason to get a more fresh taste, which boost the fruit flavour. Second reason a higher acidity level (lower pH) will give a faster and stronger gelling inside the jelly. Any left overs of the crab apples was be used for crab apple aquavit. Place the fruit piece and water in large cooking pan. Bring to the boil. Reduce the heat, and let the fruit simmer gently for 10-20 minutes, until the content becomes pulpy in appearance. Mash the apple pieces into apple mask structure. Pour the mashed apple/water into the jelly bag. Measure the amount of fruit juice and weight out 100 g sugar per 100 ml juice. Optional add in the apple vinegar in form of 1/8 teaspoon per 100 ml juice. Let it boil for 2 minute as starting point. The annual ceramic cup created for the ceramic museum CLAY is here in 2018 created by Agnethe Schimdt Bigum. And yes it has found it was into my collection of ceramic cups.It is available in both green and brown, so I naturally picked the cup in green for me. The price is 180 DDK. Last week I was yet another rowing trip together with a small group of rowers. This time we were enjoying the Western part of the big Danish fjord system called Limfjorden. In order to get the count of rowers to fit with the number of seats in the rowing boat, one rower had to spend either ½ or a whole day on land. Being "the shopper" of the group I spend a couple of hours in both Lemvig and Nykøbing Mors, where I trawled the local shops. Besides from buying various cloths in form of rain cloth, training cloth, three new dresses and a long kimono I also found a shop with various special food items (wine, alcohol, tea, confectionery, cheese and jam). In this shop I found different boxes of confectionery candy at only 20% of the original price due to end of shelf-life day and some local Thya products in form of apple juice and gin. The Thya gin contains local herbs/berries from the local area f Thy such as juniper, buckthorn, blueberry, pine spruce and angelica root. I am looking to taste both the apple juice as well as the gin. At the bread baking course we learned to learned to bake these very classic buns. I decided to twist the recipe as I had some sour cream, which was one day too old standing in my refrigerator. I also replace the liquid part in form of water with full-fat milk, as I am as dairy person is NOT afraid of using full-fat dairy products in my kitchen !! Weigh all the ingredients directly into the mixing bowl of the stand alone mixer. Keep salt & sugar away from the yeast. Place the bowl on the stand-alone mixer. Start knead the dough at speed 1 for 8 minutes. Afterwards increase the speed to 4, knead for 2 minutes. Check the consistency of the dough. If it is not OK, when knead it at speed 4 for another 2 minutes. Again check the consistency. If needed, knead again for 1 minute and when check consistency of the dough. Remove the dough from the mixing bowl and place it on the kitchen table sprinkled with flour. Let the entire dough raise for approx 30 minutes under a damp cloth. When you evaluate, that the dough has raise enough, divide the dough into smaller pieces with a weight of 65 g each. Shape the dough pieces into bun shapes. Place the bun pieces on the baking tray covered with baking parchment. Let the bun raise for second time for approx 40 minutes under a tea towel. Bake the bun at 200'C for 10-15 minutes. Cold down the buns, before serving them with a nice cup of tea/coffee. At the Summer preserves course we learn how to make a fruit vinegar in form of raspberry vinegar. Our tutor also told us, that we could use the same recipe and when make blackberry vinegar, when the blackberry season starts in end Summer/beginning of Autumn. A good rowing friend picked a portion of blackberries for me in return for sharing the fruit vinegar recipe with her. I think this was a pretty good deal for me :-) I can easily understand why, blackberry is named blackberry as your fingers turn quiet dark purple, when you work in the kitchen with these berries. If you have been picking a lot of blackberries, you can also use these berries for jams such as blackberry jam with liquorice, blackberry jam with vanilla and lemon and my classic Christmas jam with blackberry. Other suggestions on blackberry vinegar without sugar addition are blackberry vinegar with rosemary and blackberry vinegar with tarragon. Place the blackberries in a bowl and pour over the vinegar. I have brought this ice cubes in size XXL in one of the local Inspiration shops located in Vejle. 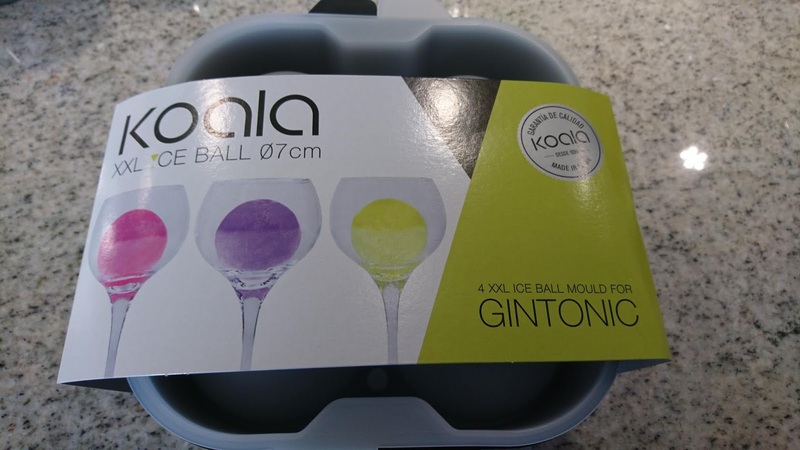 So fare, I have only been making ice cubes in size XXL for my favorite drink of gin tonic. 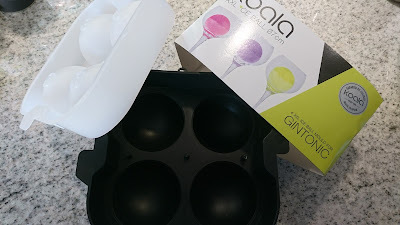 However, I do many options for this ice cube forms, perhaps making sorbet, ice cream or ice cubes with whole berries inside ? Together with a good rowing friend I recently visited the exhibition of some of the the Danish Queen's dresses at the musuem "Den Gamle By" in Aarhus. At this outdoor museum you can see various types of town houses from different locations in Denmark, which has been re-build at this museums. In some of the houses they have created different shops, where you can buy souvenirs with relation to the museum. 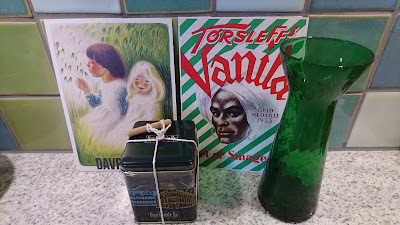 In some of these shops I found two post cards with old Danish classic commercials, one for oat flakes and the second for vanilla pods. I also brought a glass vase for force growing hyacinth during Winter time in the living room. And finally some tea from Perchs in form of a special version created specific for the museum in form of both a special decoration of the museum on the tin and off cause the tea. The tea is a mixture of black & green tea with addition of rose petals, jasmin flowers and flower flavouring. Tapas is an easy way to serve a meal on a week-end eve. 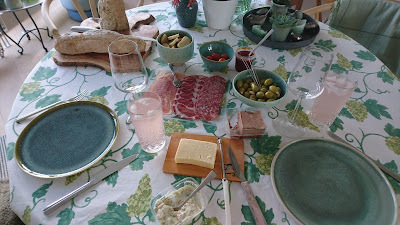 I served a selection of various Italian meat slices (ham & sausages), matured Cheddar with tomato and chilli jam, fresh seafood salad with mayonnaise, green olives with almonds inside and small tomatoes. All of this was eaten with either whole grain bread or baguette (served on my fantastic olive chopping broad from Greece). For this meal we enjoyed gin & rose lemonade together with a glass or two of white wine. Let the entire dough raise for approx 20 minutes under a damp cloth. When you evaluate, that the dough has raise enough, divide the dough into smaller pieces with a weight of 60 g each.